Organized medicine continues to predict a large physician work force shortfall [PDF]. This will arguably be made worse by the expanded access (and presumably increased utilization that comes with such) granted by the Affordable Care Act. While I am whole heartedly on board with questioning some of the reasoning models used to figure future physician demand, I’m not sure the authors of the New York Times piece don’t fully account for the real world workings fee for service medicine, in that their arguments seem to ignore the basic fact that physicians create their own demand in our current system. Minimally invasive procedures, like laparoscopic surgeries, can be done more quickly with faster recovery times and fewer physicians. An average patient stay in the hospital is about two days or less following a stent but about seven days following a coronary bypass operation. Research on radiation treatments for breast cancer suggests that 15 treatments can be just as effective as the traditional 30 treatments. Likewise, one larger dose of radiation can be as good at relieving pain from bone metastases as five to 10 separate, smaller treatments. There’s every reason to expect the pace of these timesaving medical innovations to continue. That’s a naive way of describing technological and procedural innovations’ impact on American health care. The way it works is when you do lap choles faster you just do more surgery. And in such a case the system continues to support the same number, or perhaps more, surgeons. And, in terms of the workforce, who cares how long a person is in the hospital? That has no influence really on how many physicians we need. We may indeed not need as many physicians as organized medicine thinks we do. Personally I think we may have some sort of shortage but the real problem is the ratio of primary care to specialists. If however we truly aren’t in the middle of a worsening shortage I’m not sure ‘technology is going to make us more efficient’ is the argument to make considering the way we currently finance healthcare in the United States. Don’t get me wrong, I’ve written previously with some admiration for Devi Shetty. But an op/ed in the Washington Post calling on U.S. hospitals to be more like those in India sugarcoats the major obstacles to such and I think ignores coming changes in rising economies. [T]he transfer of responsibility for routine tasks to lower-skilled workers. This leaves doctors free to focus on complicated medical procedures. Several hospitals have created a tier of paramedic workers with two years of training after high school to perform routine medical jobs. As a result, surgeons, for example, are able to perform two to three times as many surgeries as their U.S. counterparts. Compare that with the United States, where hospitals reduce costs by laying off support staff and shifting mundane tasks such as billing and transcription to doctors, who are overqualified for those duties. That task shifting includes things like families of patients performing basic nursing tasks and a stoicism amongst patients that simply is not part of American culture. U.S. hospitals are constrained by regulations and norms unlike those in India. The Indian experience shows that costs can be dramatically reduced and access can be expanded even as quality is improved. India’s costs are low somewhat because India’s costs of living are low, they have little to no R&D costs, they have far fewer regulations and, most importantly, expectations are currently far less than those in the United States. 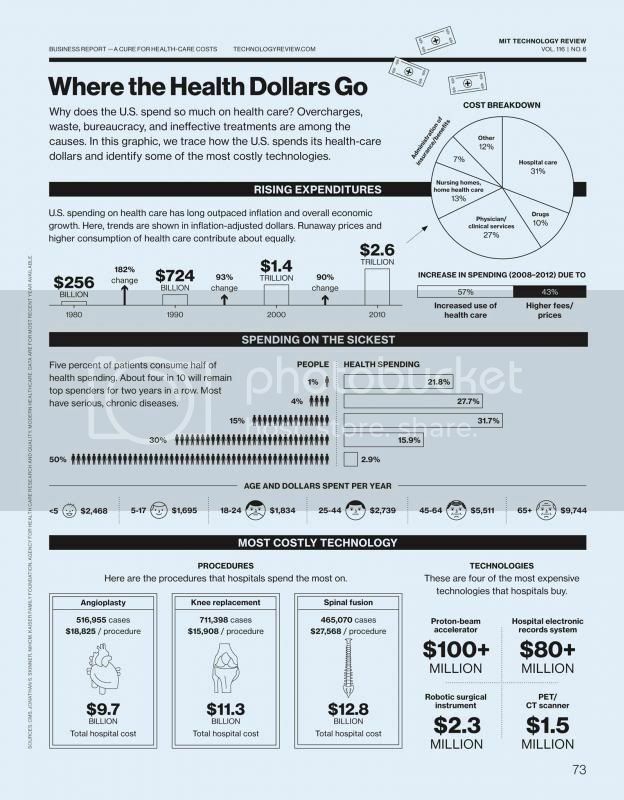 The U.S. spends at the periphery of healthcare. That spinal fusion of questionable indication or that proton beam for your cancer or that lengthy ICU stay when the prognosis is terrible are not things that contribute really to population based metrics, and they’re not things that Indian patients are currently seeking but they’re major contributors to costs. I want to see the private forces Vijay Govindarajan and Ravi Ramamurti cite in their op/ed keep control on health care costs eighty or ninety or one hundred years from now when the growth of Indian wealth helps lead to social expectations of health care are on par with what we have here in the U.S. And India is moving that way; we shouldn’t kid ourselves about any notion that current social values and ideas on end of life and health care in Indian culture are immutable. Eventually this “quality of death” is not going to be acceptable. In such a sense India’s current efforts aren’t some “new” health care. And the Indian health care consumer is slowly moving to be more like the U.S., not the other way around. Only top down/government forces will keep the costs of Indian health care down under such a situation. India’s going to have to learn from Europe. Not America learning from India. There’s a nice, brief editorial ahead of publication in the New England Journal of Medicine. Everyone needs to consider this when discussing American physician earnings; especially as compared to the rest of the world. [I]f we aim to reduce the costs of health care, we need to reduce the costs of medical education. We don’t have to believe that the high cost of medical education is what causes increases in health care costs in order to develop this sense of urgency. We just have to recognize that the high costs of medical education are sustainable only if we keep paying doctors a lot of money, and there are strong signs that we can’t or won’t. Only about 20% of health care costs are attributable to physician payments, and many of the current efforts to reduce costs are aimed elsewhere, such as hospital payments, and have only indirect effects on physicians’ earnings. But physicians’ and dentists’ earnings have been sluggish since the early 2000s.3,4 Even if prospects for physicians’ income fall fast, a burst bubble can be averted if schools see it coming before their students do and lower their prices. I like reading Mark Stephens (to separate from others who also use the Cringely persona). Every once in a while he strays into the intersection of his world and health care. In a recent post the argument seems to be that big data has allowed the underwriters to hyperspecifically target to deny or price out individuals at risk. 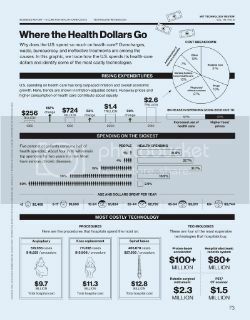 [I]n the 1990s something happened: the cost of computing came down to the point where it was cost-effective to calculate likely health outcomes on an individual basis. This moved the health insurance business from being based on setting rates to denying coverage. In the U.S. the health insurance business model switched from covering as many people as possible to covering as few people as possible — selling insurance only to healthy people who didn’t much need the healthcare system. It’s a nice theory but I don’t think this has played a large role in the rise of the uninsured in America. I think its small potatoes in the factors that are driving such. Many states have specific restrictions on the use of individual data in underwriting. New York and Vermont have essentially pure community rating (at least for some insurers). Many other states have other, less restrictive but still important limitations on the use of individual data in underwriting or on how it can be used to determine premiums. These include Maine, Rhode Island, Massachusetts, Connecticut, New Jersey, Washington, Oregon, Colorado, Minnesota, North Dakota, South Dakota, Iowa, New Hampshire, Montana, Nevada, Utah, Kentucky, Idaho, Louisiana. All of these restrictions put some brakes on the influence of big data in moving underwriting much. Not that such methods aren’t nowadays used by health insurance actuaries but the influence may be overstated. The fact is that the majority of Americans continue to receive their health insurance through group plans, primarily through their employers. And most of those people get their insurance through large group plans where such individual underwriting has less to no influence on premiums. 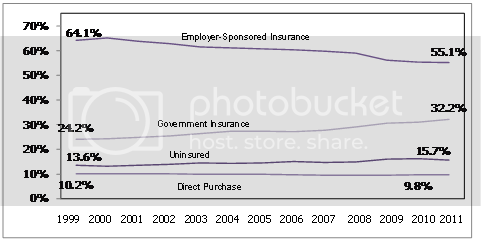 The rise in the percentage of uninsured correlates nicely with the decline in employer provided insurance and that reflects the growing costs of premiums. Indeed the individuals buying insurance on the open market, those you would imagine most hurt by complex underwriting techniques based on big data, has remained relatively stable. There are plenty of factors behind the rise in group premiums which have driven employers to drop health insurance as a benefit but I don’t think the use of big data by actuaries is a major one of them. Across Fox News and the internet are stories of individuals having their insurance plans canceled or not offered for renewal as a consequence of Obamacare. In the place of their previous plans they are being offered more expensive health insurance options. This despite President Obama’s promise. Let’s just get to it, that promise by the President was stupid because the Affordable Care Act was designed to basically costs people with bare plans, with marginal benefits specifically to lose their insurance. Forbes is running a composite piece of stories out of the AP and Kaiser Health News and others, comparing how many plans have been canceled versus how many people have been able to sign up for new plans in the exchanges. But Sarah Kiff over at Wonkblog explains why this is happening and why this was actually a planned consequence of the Affordable Care Act. Some — or maybe even most — of the plans offered on the individual insurance market right now don’t meet certain requirements in the health-care law. They may not offer preventive care without co-payment, for example, or leave out coverage of maternity care, one of the health-care law’s 10 essential benefits. And insurances simply aren’t grandfathering in these plans as their underwriting changes. So they’re having to cancel them because they don’t meat the requirements under the law. And people are losing their plans. The stupid thing isn’t necessarily that this is happening. If you’re a proponent of the Affordable Care Act you’ll see the more expensive plans people may have to buy as a necessary thing for the success. If you’re an opponent this doesn’t change your opposition. What’s stupid, and should be universally agreed as such, is the fact that the administration pretended like this wasn’t going to happen. Including, most unforgivably, the president himself. Competition can be good for driving down the costs of healthcare. A lack of transparency is one obstacle to legitimate competition. Prices are negotiated between payers and providers without a sense from the actual consumer or a sense of what payers have negotiated with other providers. Providers keep their numbers lower to upwardly influence their negotiations with payers. I’ve written before about Devi Shetty and his ambitions in India and the Cayman Islands. What I largely took away from him is efficiency and volume and how regulations increase costs. But a big part of his effort is also transparency in costs. And while I don’t know if it will stick, such transparency is coming in small pieces to the U.S.
Here’s a profile of the Surgery Center of Oklahoma which is publishing its prices, taking cash or direct payments only and negotiating directly with businesses as a matter of course. Of course, one thing the Affordable Care Act does very limit for is transparency. The hopes for this as a true trend and as a disruptive force in American health care seem muted at best. Patients are hooked up to Sedasys and sedated intravenously. While connected, a patient’s condition is monitored by the machine. It measures oxygen levels, for instance. If there is a problem, the machine alerts the physician, and is supposed to take action, such as increasing the oxygen supply and stopping the anesthesia, and resumes only if the patient’s condition normalizes. Patients also wear an earpiece, in case they drift into too deep a level of sedation and need to be awakened. As a doctor or nurse would do, the machine would, through the earpiece, tell the patient to wake up. Its coming, even for surgeons eventually. Saving grace might be the lack of a human touch.